We are pleased to announce the publication of SEM Student News Volume 14, Number 2. 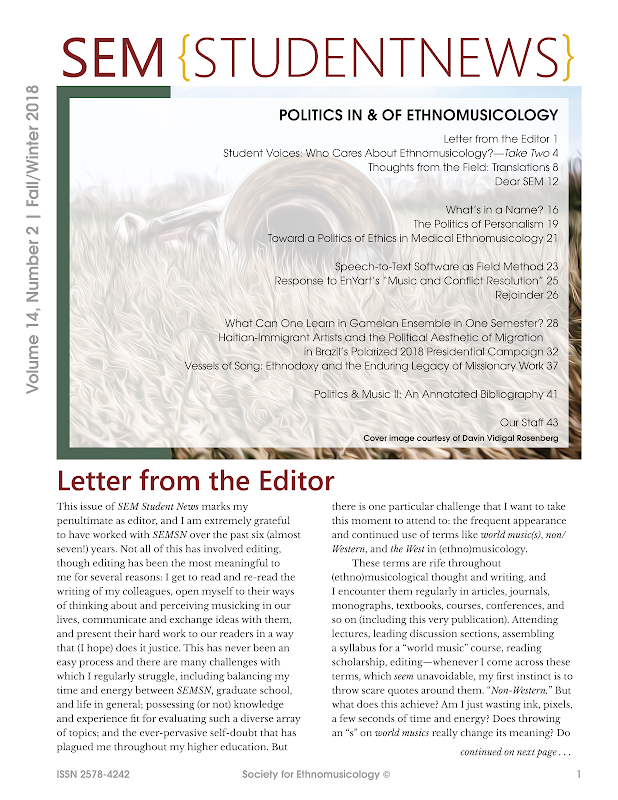 This new issue continues our previous political theme and focuses on the internal negotiations of the field of ethnomusicology and academic departments and spaces. Discussions feature the nuances and ethics of translation; negotiating early career challenges and academic politics; as well as responses and rejoinders to articles in Volume 14, Number 1. We hope you will enjoy and find use for the many excellent contributions by student and senior scholars. You can read the issue here and join the conversation on our Facebook page. Please feel free to forward this message and share the issue widely. We are pleased to announce the publication of SEM Student News Volume 14, Number 1. This issue focuses on a theme of music and politics and features articles on various topics, including Glocal politics in Bavarian slang rap, political discourse in Janelle Monáe's "Q.U.E.E.N.," music and conflict resolution in Israeli-Palestinian relations, affirmative consent and the ethics of fieldwork, and more. We hope you will enjoy and find use for the many excellent contributions by student and senior scholars. 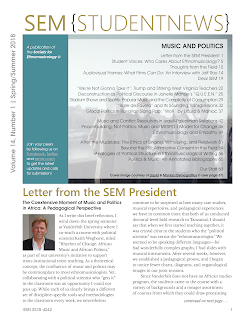 The following bibliography is a supplement to SEM President Gregory Barz's letter, “The Coextensive Moment of Music and Politics in Africa: A Pedagogical Perspective,” in SEM Student News 14.1, Spring/Summer 2018. Agawu, Kofi. 2016. “Music and/in Society.” In The African Imagination in Music, 27–64. Oxford: Oxford University Press. Aidi, Hisham. 2014. Rebel Music: Race, Empire, and the New Muslim Youth Culture. New York: Pantheon. Allen, Tony. 2013. An Autobiography of the Master Drummer of Afrobeat. Durham, NC: Duke University Press. Anderson, Benedict. 1983. “Introduction,” “Cultural Roots,” “The Origins of National Consciousness.” In Imagined Communities: Reflections on the Origins of Nationalism, 11–16, 17–40, 41–49. London: Verso. Ansell, Gwen. 2004. “Jazz for the Struggle, and the Struggle for Jazz.” In Soweto Blues: Jazz, Popular Music, and Politics in South Africa. New York: Continuum. Asante Darko, Kwaku. 2000. “Reggae Rhetoric and the Pan-African Risorgimento.” Mots Pluriel 16. http://motspluriels.arts.uwa.edu.au/MP1600kad.html. Askew, Kelly M. 2002. Performing the Nation: Swahili Music and Cultural Politics in Tanzania. Chicago: University of Chicago Press. *This column also appears in SEM Student News 14.1, Spring/Summer 2018. Ethnomusicologists engage with media production continuously. Starting from recording music making, using audiovisual technologies pushes our field toward new narrative forms, where audio and video outputs integrate not only into writing but become the very core of research projects. This column provides a space for thinking on the politics of audiovisual representation in ethnomusicological research by exploring the work of researchers who seek to overcome the limits of written scholarly production via documentary filmmaking, photo reportage, audio recording, and online platforms. Jeff Roy. Photo by Ryan Ballard. 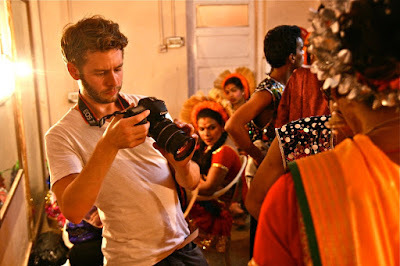 I first came across Jeff Roy’s work when I read his 2015 doctoral thesis, "Ethnomusicology of the Closet: (Con)Figuring Transgender-Hijra Identity Through Documentary Filmmaking," where he actively engages his critical use of documentary filmmaking inside Indian trans-hijra performance with the (con)figuration of trans-hijra LGBTIQ+ identity. Having earned his PhD at the University of California, Los Angeles, in 2015, Jeff Roy is now a Postdoctoral Fellow at Le Centre d’études de l’Inde et de l’Asie du Sud at Université Paris Sciences et Lettres. He has worked as a director for several documentaries, including the medium-length Mohammed to Maya (2013) and the documentary series Music in Liminal Spaces (2012–2013), fostering a research commitment deeply connected with his public engagement as an activist for the rights of the Indian LGBTIQ+ community. I chose to ask him some questions that are strictly related to his audiovisual work, his public role as an activist, and more broadly, how today’s ethnomusicologists can engage with documentary production and the public dissemination of their research results. This is the first call for submissions for the Spring/Summer 2018 issue of SEM Student News. This new issue, vol. 14, no. 1, will focus on a theme of Music and Politics with particular attention to music-making as political intervention and discourse. We are seeking article submissions on any topic, but will give preference to those that fit within our theme’s area of discussion. Likewise, we will consider submissions from both students and working scholars alike, and encourage authors to submit pieces in a variety of media.